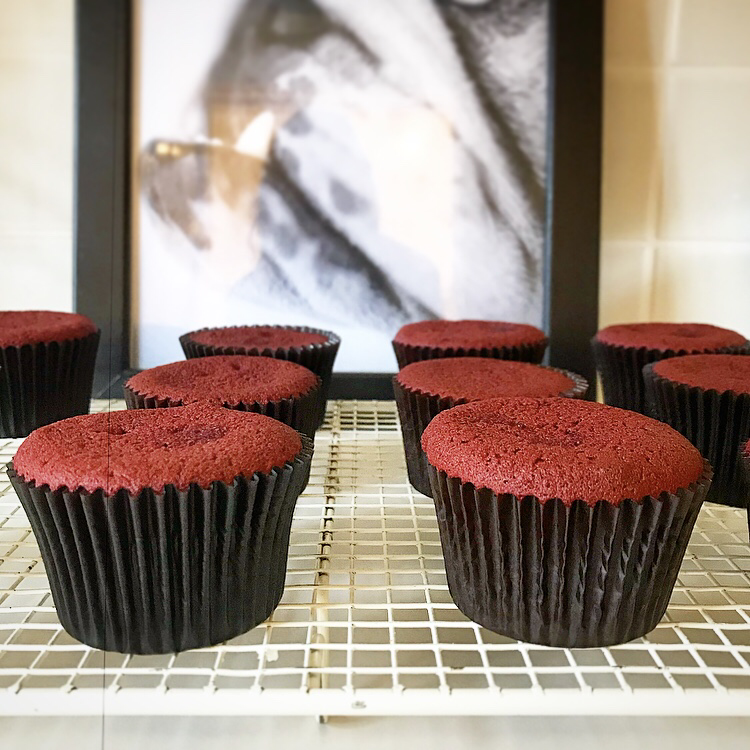 Thank God for baking, it’s definitely keeping me occupied during this period of time while we wait for labour to start and meet our new arrival! Not only is it something I really enjoy, it relaxes me and helps to keep my mind occupied (and stop me getting too anxious about whats to come). 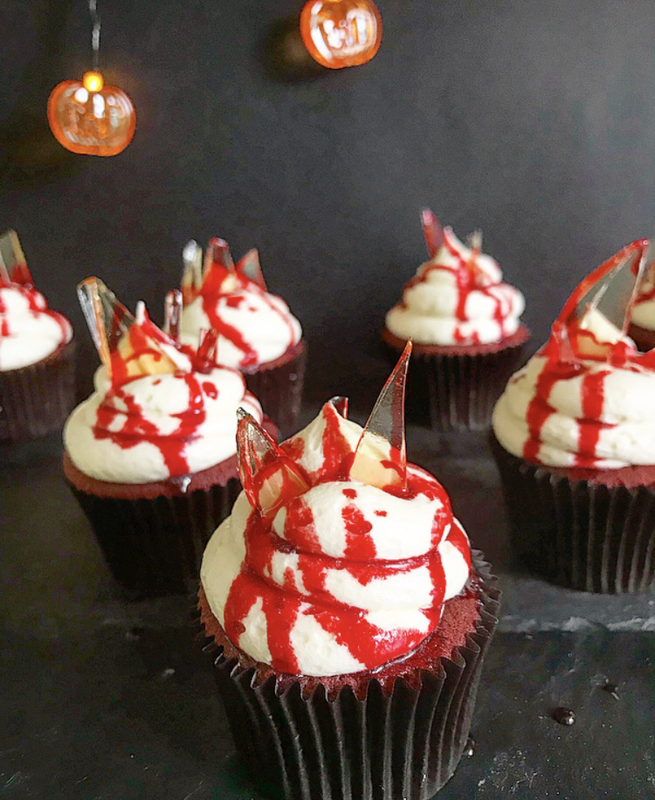 Also the house is always filled with delicious treats, which is another bonus, and is nice for any visitors as well! 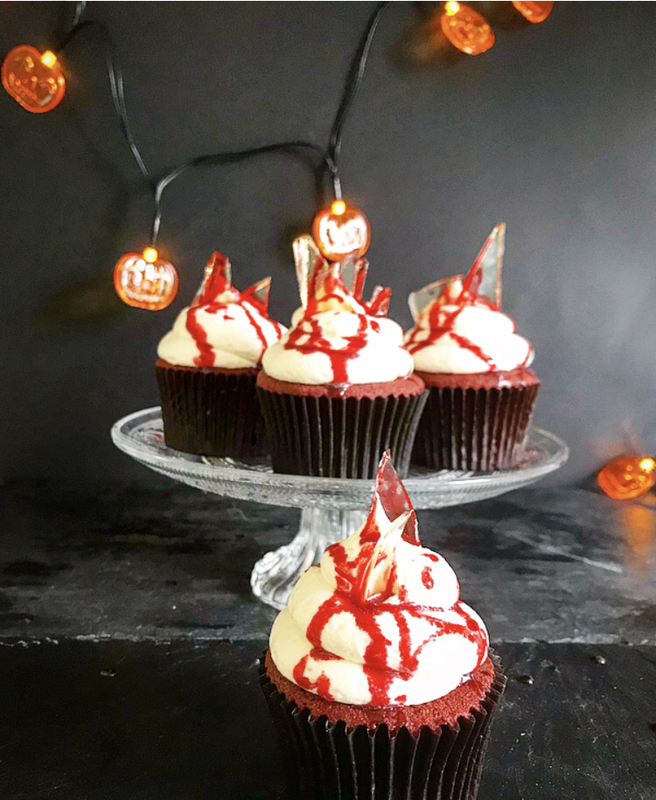 This recipe without the sugar glass and edible blood makes a classic red velvet cupcake with cream cheese frosting. 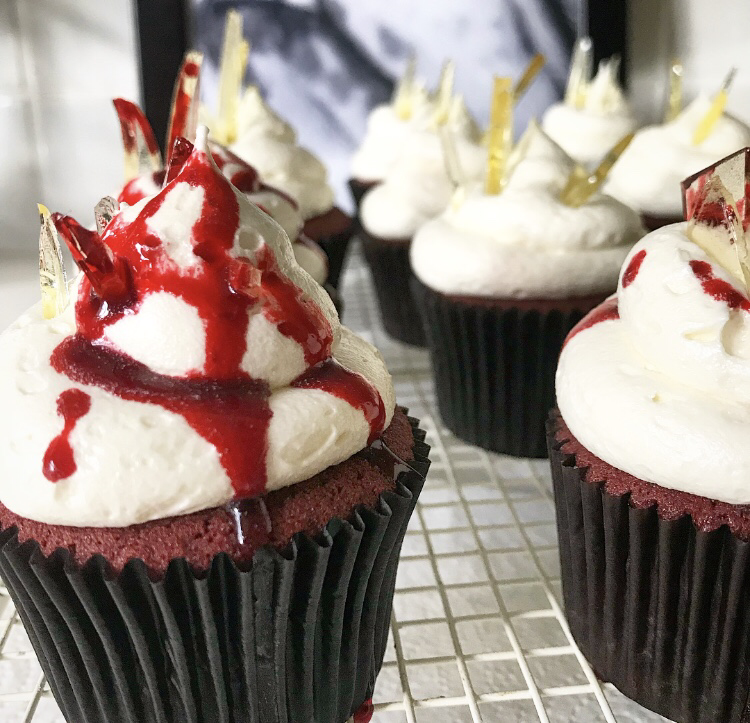 I think the recipe is essential for any bakers repertoire, you can make them any time of year so keep the recipe on hand. 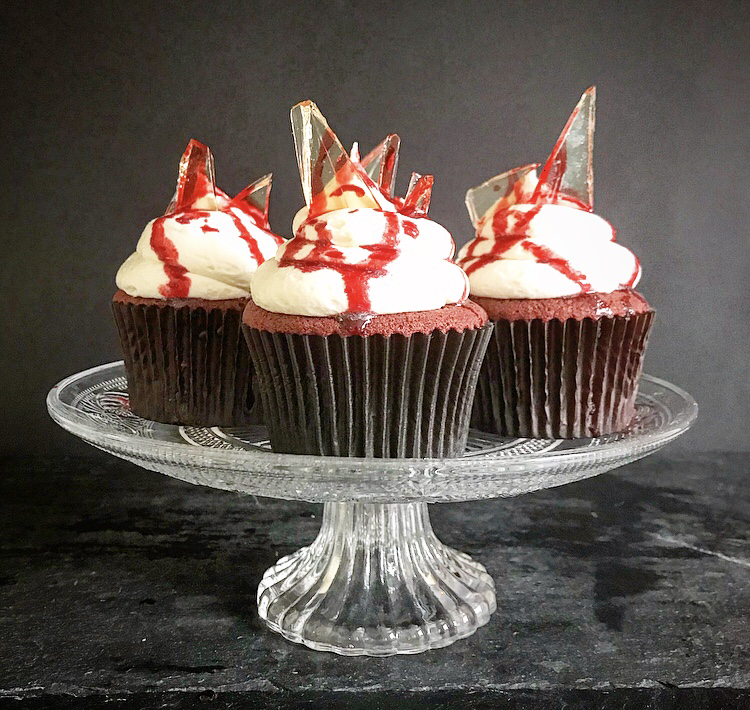 However once decorated these spooky cakes are perfect for a Halloween party or occasion – they look really realistic but once you get past the appearance they taste delicious too! Heat oven to 180C/160C fan/gas 4. Line 12 holes of a muffin tray with paper cases, black or dark brown work well. 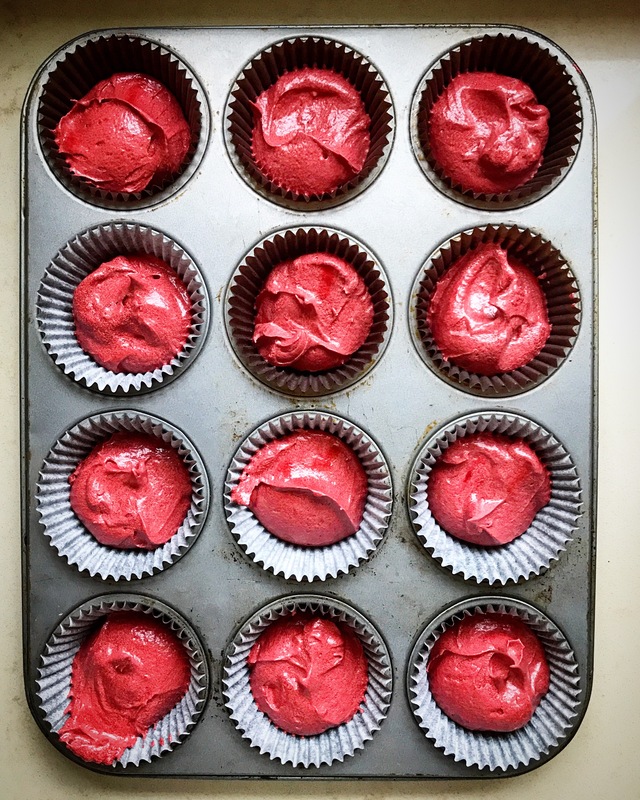 For the cupcakes using a stand mixer or in a bowl with electric hand mixers beat the stork or soft butter and caster sugar until really pale and fluffy, about 2-3 minutes. Add the vanilla and the eggs, one at a time, beating well between each addition. 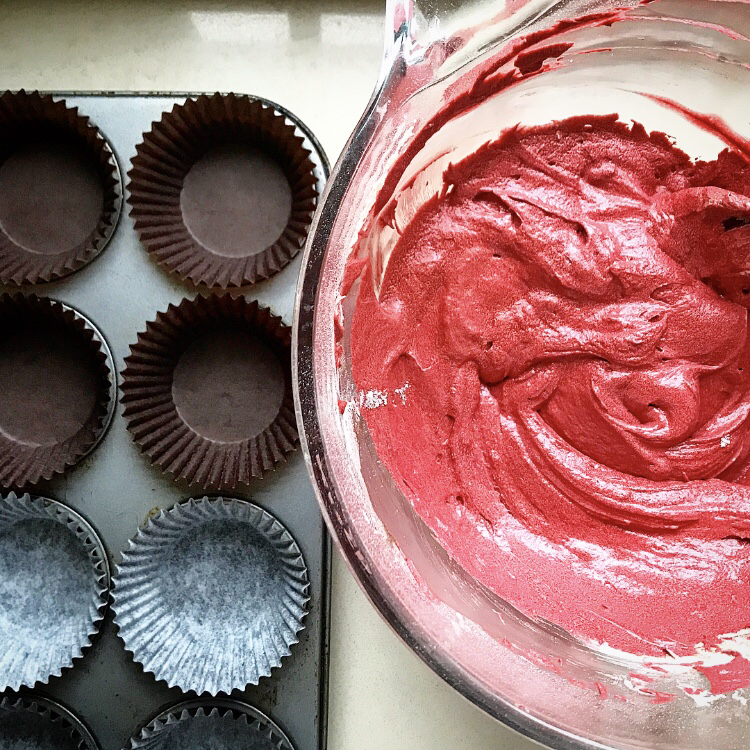 Next fold in the flour, cocoa, bicarb, salt, buttermilk and vinegar adding enough red food colouring to achieve a bright red batter. Mix until lump free. Divide between the cases; they should be 2/3’s full (using an ice cream scoop works perfectly for me). 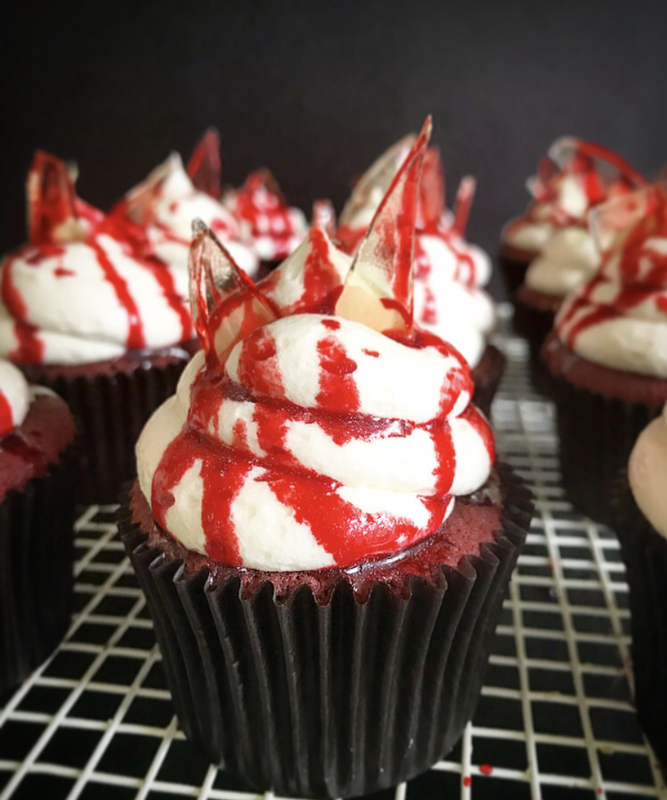 Bake for 20-22 minutes, until springy to the touch and a skewer inserted comes out clean. Allow to cool in the tins for a little then lift onto a wire rack to cool completely. 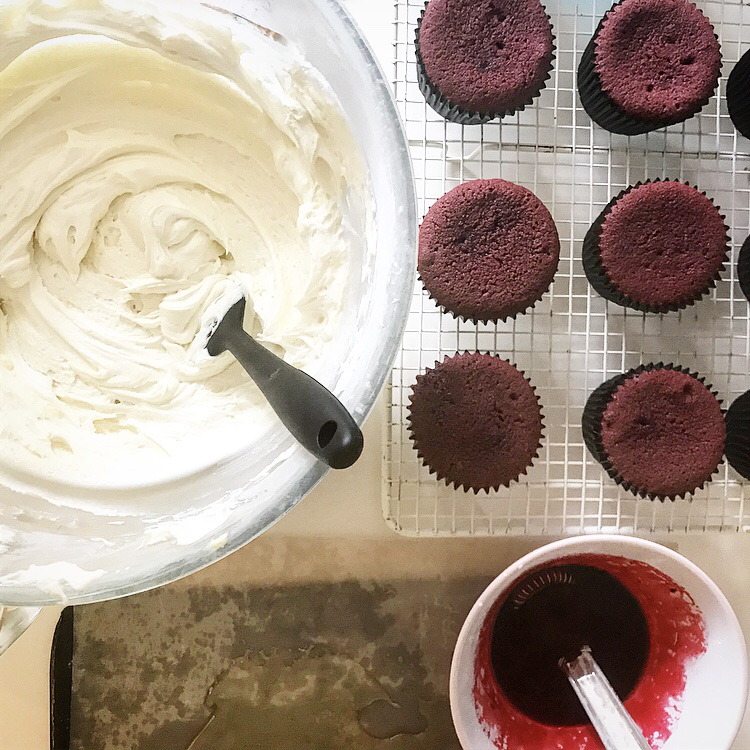 For the frosting using a stand mixer or in a bowl with electric hand mixers beat the butter, soft cheese, vanilla and icing sugar for 2-3 minutes, until you have a smooth thick icing. 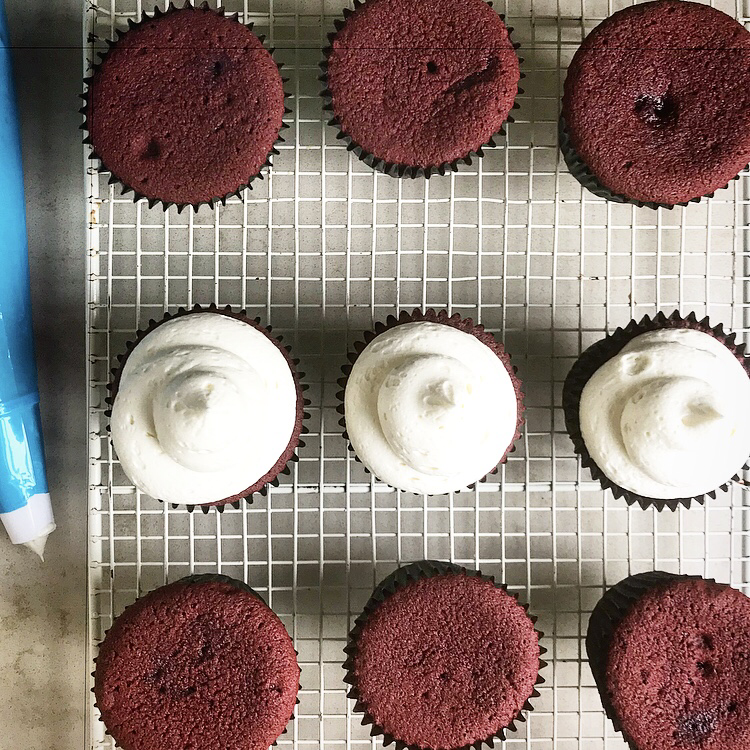 Tip into a piping bag filled with a large round nozzle (or just snip off the end and pipe without a nozzle). Once the cakes are cool pipe each one with a mound of icing. Transfer to the fridge to set for 20 minutes. 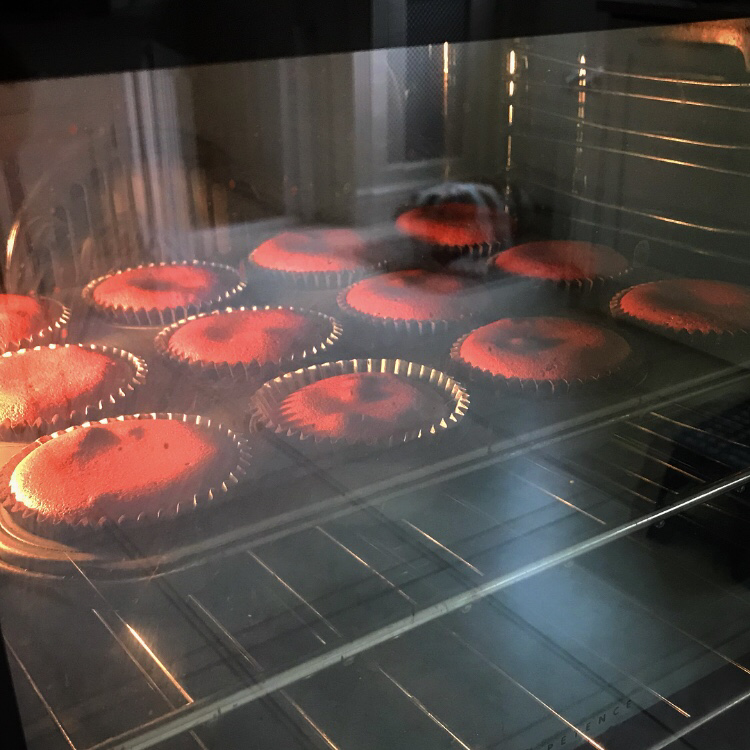 The cakes can be left as they are now or…..
Oil a metal baking tray or line a baking tray with a non-stick cooking mat (you can get these from Poundland.) 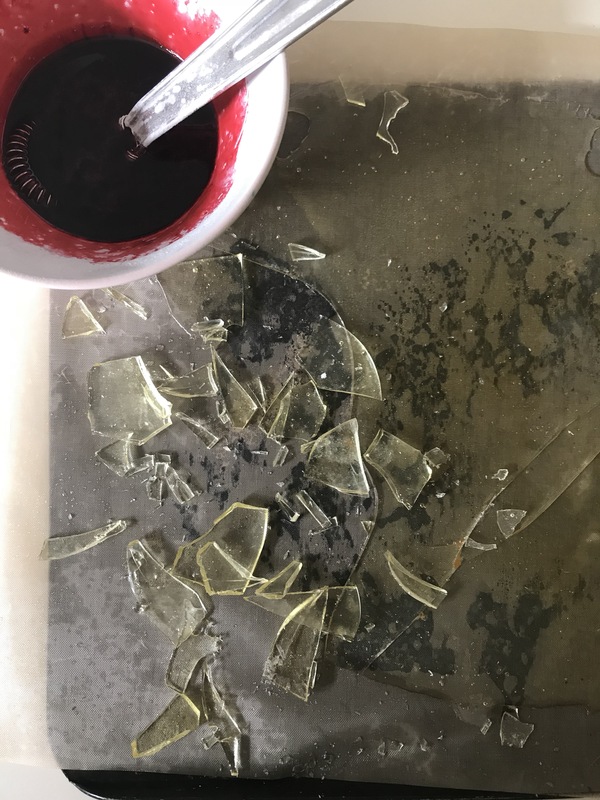 To make the glass put all the ingredients in a heavy bottomed pan, heat on a low heat until the sugar dissolves then bring to a rolling boil and boil until a sugar thermometer reads hard ball – 300F. Turn off and pour the caramel onto your prepared tray. Allow to set for about 20 minutes then smash into shards. 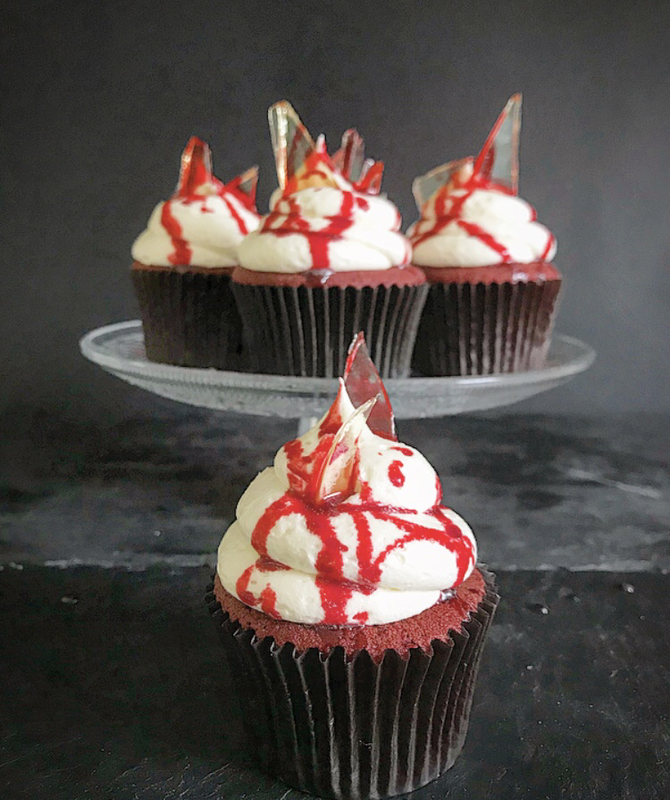 Mix all of the ingredients for the edible blood in a small bowl until you have a gloopy consistency, add some red food colouring and a tiny, tiny amount of blue and mix until you have a deep, blood coloured goo. Add a little more icing sugar if you need to thicken it. 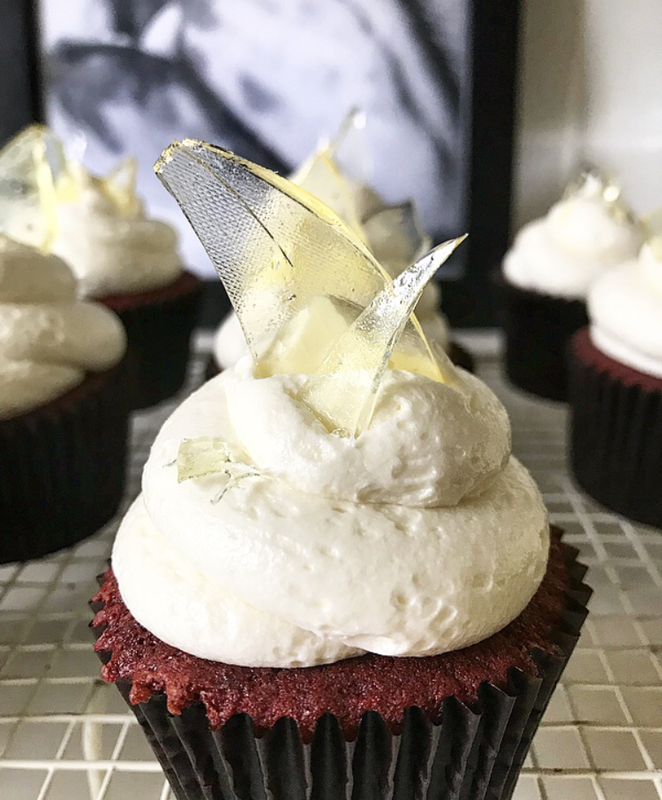 Take your iced cakes and insert a few shards of ‘glass’ into each. 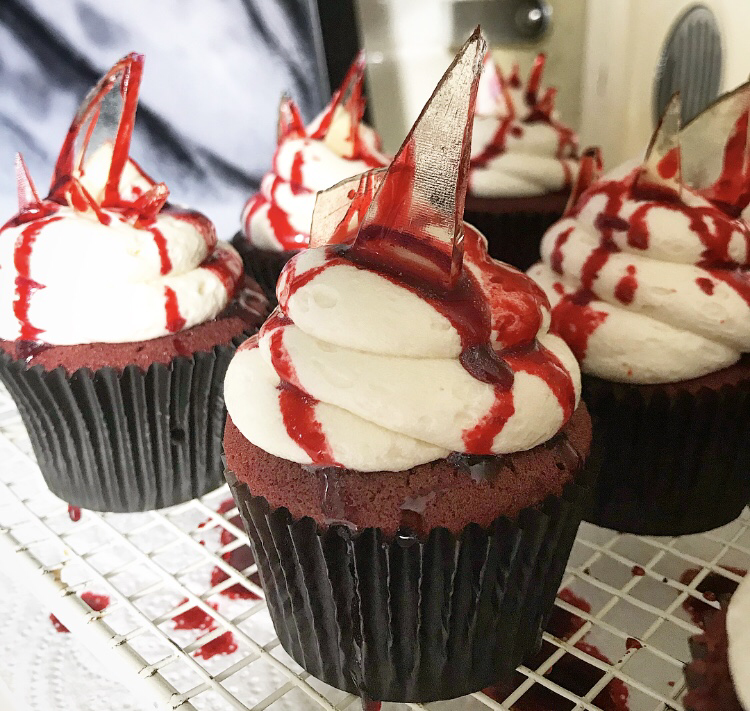 Then drizzle over the blood. Serve or keep chilled until about 30 minutes before eating, then allow to come to room temperature. Previous Post Triple Chocolate & Sea Salt Cookies & My Tips for Thriving, Not Just Surviving, Throughout Pregnancy. Next Post Welcome to Motherhood…Pass the Biscuit Tin.